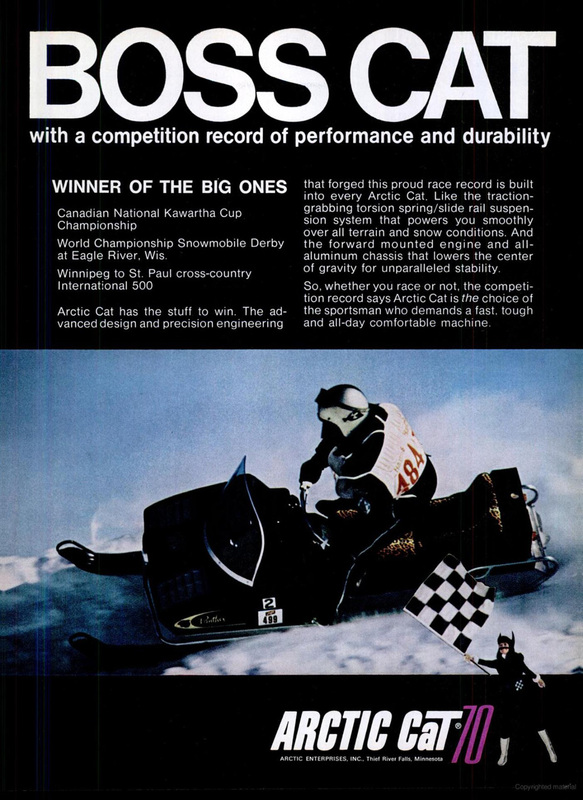 The above advertisement from 1970 brings "Boss Cat" into the mix, a monicker that would come to define later speed run machines and Arctic Cat in general. When you build models with the name King Kat and sporting the largest displacement engines anywhere, you talk about it. Just as Cat did in 1971 with this ad. 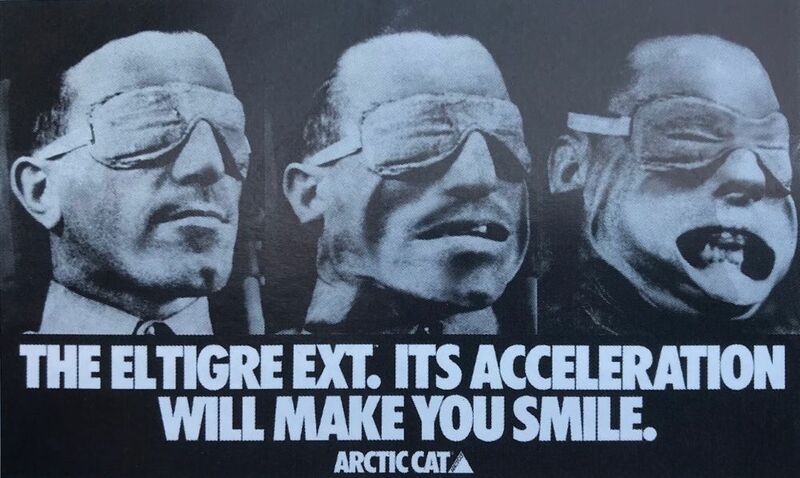 Countless are the number of now-grey-haired sledders who saw the above marketing in 1978 and immediately aimed their desire at an El Tigre. Count me among them. 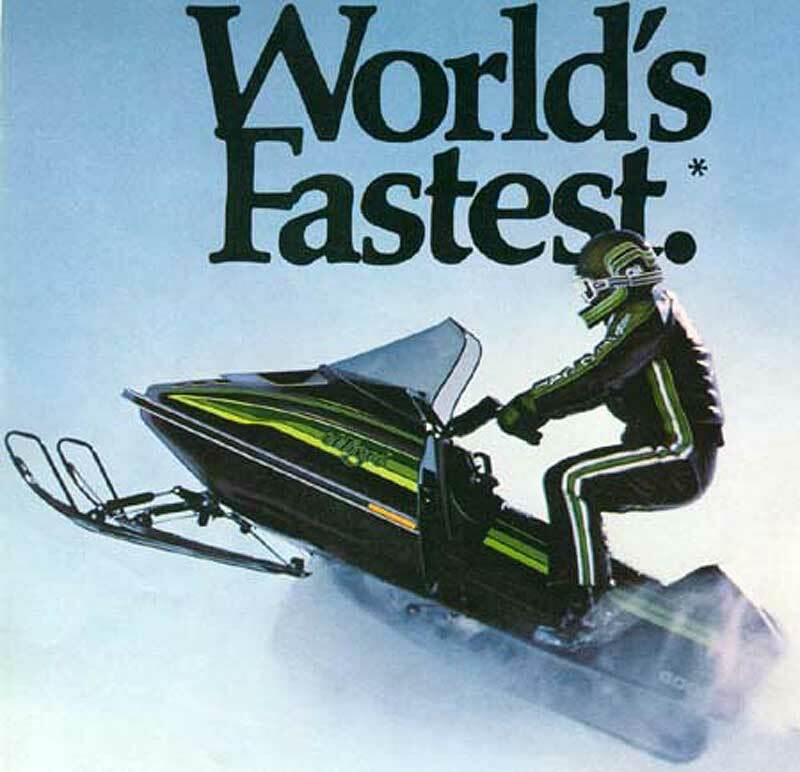 When Arctic Cat set the fastest MPH in the 1981 Snow Goer Shootout with the El Tigre 6000, it capitalized on the honor with another powerful image and to-the-point headline. When the 650 Wildcat debuted for the 1987 model season, Arctic Cat was confident that they had regained the top spot. Okay, this was used pretty heavily in 1989 and it definitely made its point, but I was always a little creeped out by it. Still am, actually. 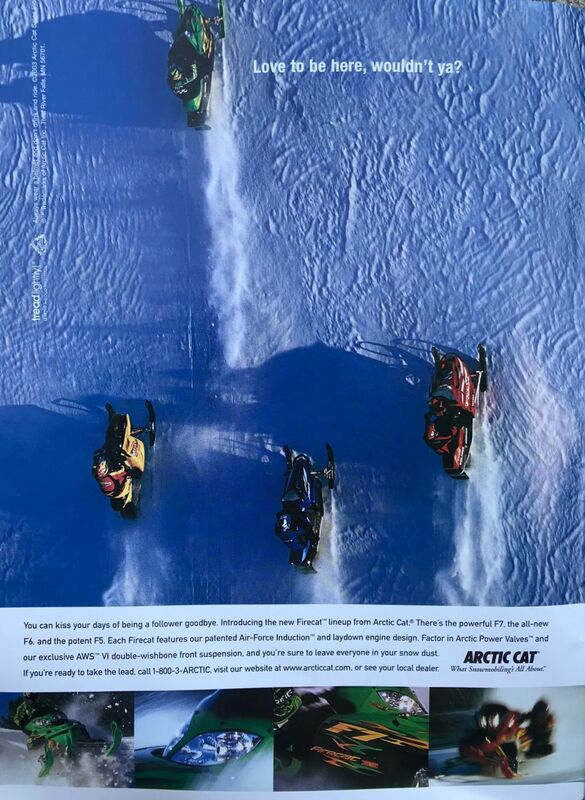 The 2003 Arctic Cat F7 Firecat was (and still is) one of the all-time asskickingest snowmobiles every made. 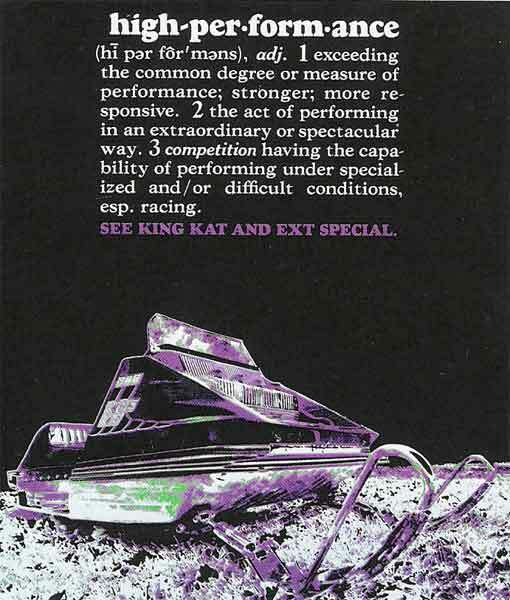 Arctic Cat played up that fact the following year with this literal and accurate ad touting its lake race performance. Arctic Cat Twin Spar chassis sleds weren't the most nimble. But when equipped with the 177-hp Suzuki 9000 Series Turbo 4-stroke, they were definitely the world's fastest, a fact that Cat leveraged in its marketing efforts in the late 2000s. 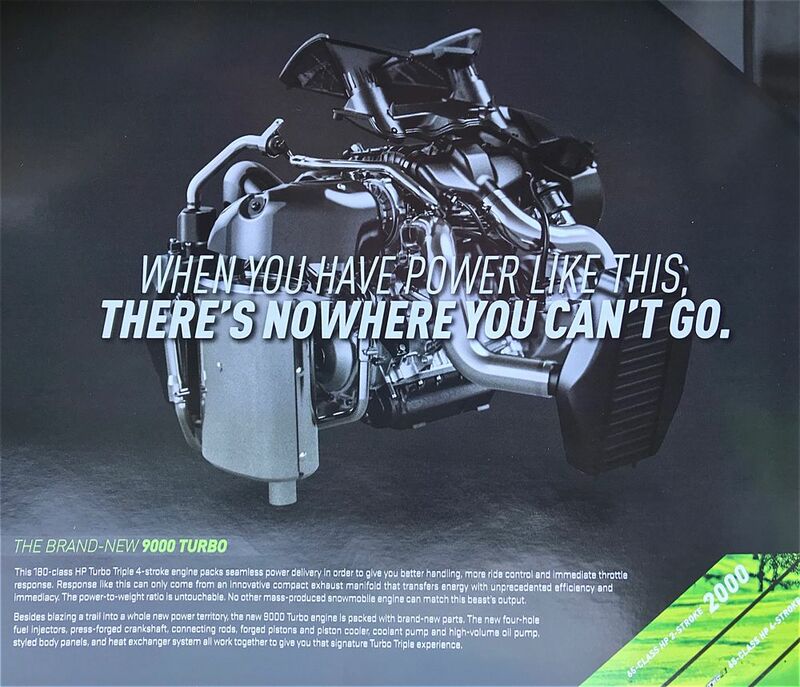 With the emergence of the Yamaha-powered 9000 Series 4-stroke Turbo in 2017, Arctic Cat stayed firmly on the gas and on top of the performance speed war. 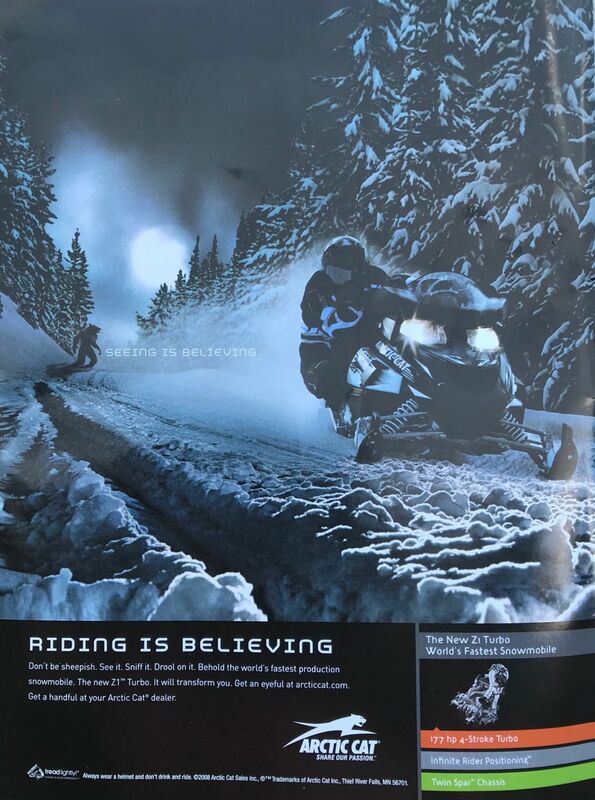 There are of course many, many other Arctic Cat ads from over the years that flex its performance muscle. It's part of the company's DNA to build wicked-fast sleds and to beat its chest about 'em. 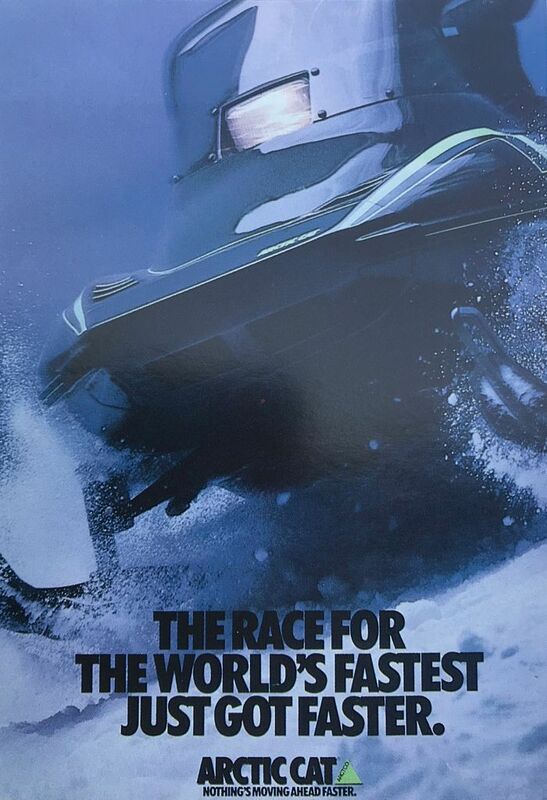 Keep it up, Arctic Cat! AC has always produced the FASTEST sleds period. I worked as a mechanic for a Polaris dealer for about 10 years ran Polaris until I kept getting beat by Cats now I own 6 2 Thundercats 93 and 94 and a 9000 Turbo,incredible sleds to say the least! John Deere Joe - Want to sell it? 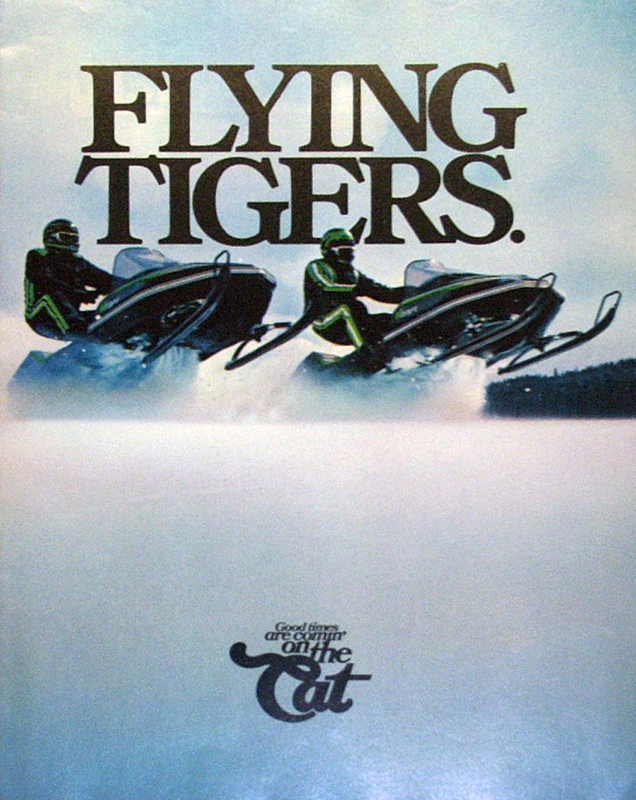 One of my favorite Cat ads was the Thundercat poster that featured a "demon" looking face that blended into the cylinders/heads of the said sled. It was absolutely awesome! Brandon, i got the sweatshirt with that pic on it,, my wife calls it the "powerhead" shirt. Oh yeah,, BTW,, that comment about the now grey haired guys wanting an ElTigre, yep, that's true. Got lotsa grey hair and after seeing that ad, bought a '79 ElTigre 6000 the next year. My older brother had a 5000.